Crowned wings and anchor. 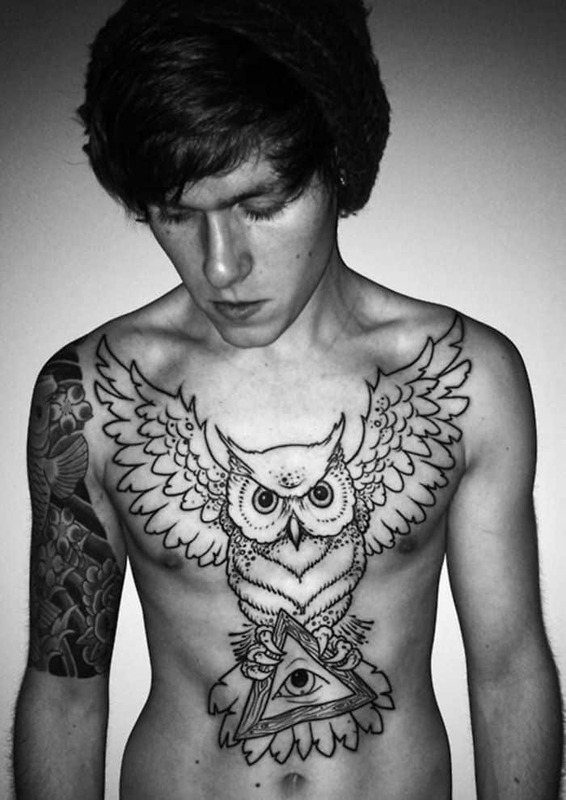 This chest and abdominal tattoo extents the will of God from the sky to the sea. The banner “Thy Will Be Done” reveals the bowing of humanity to the heavens that create, lead and carry us. Strength in a bed of Roses. 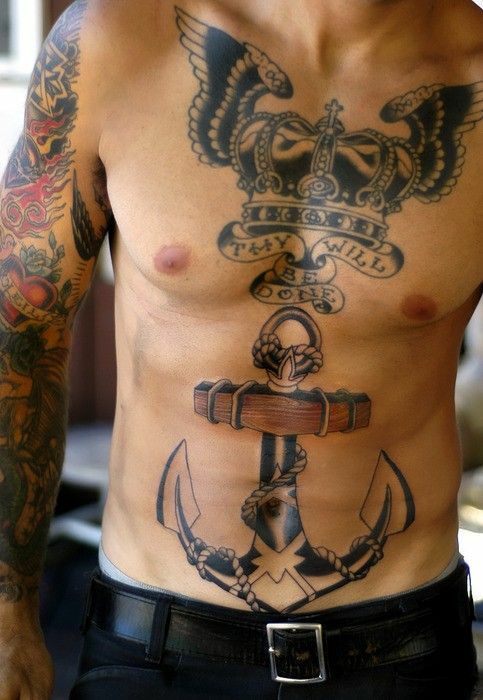 The anchor portrayed upon the heart of its owner speaks of holding in place in strength and fortitude. 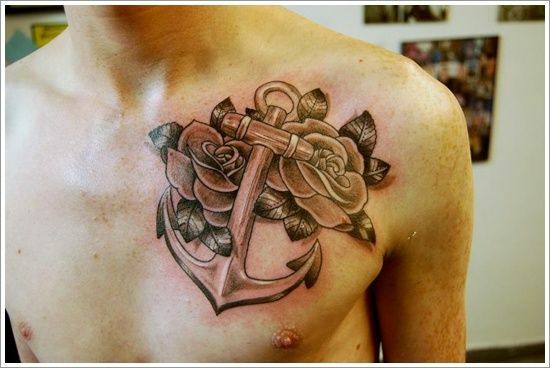 The delicacy of roses that engulf the anchor contradicts but bolsters this strength while singing of beauty and fragility. We Meet Where Time Stands Still. 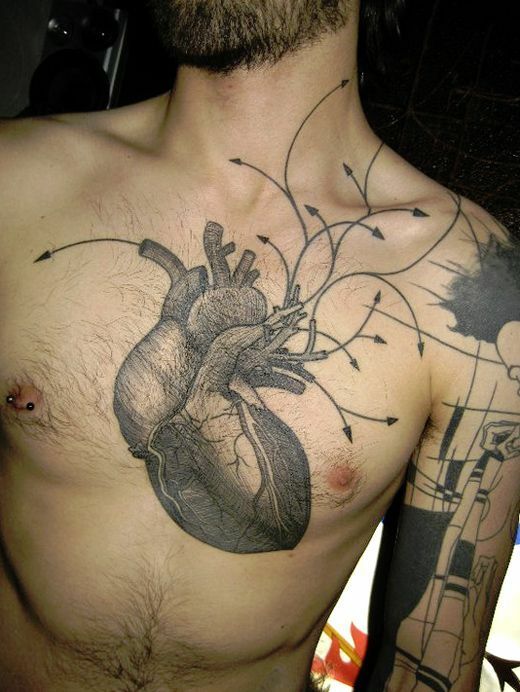 Embedded faces in this original tattoo face away from each other as their souls connect with the hourglass frozen in a slice of time. The tattoo is accented with a full sleeve of flora that also encompass the boundaries of the timepiece. The all-knowing eye. Form and style fly in the face of a nocturnal apparition carrying a triangular frame of infinite wisdom as the eye keeps watch over all by night. 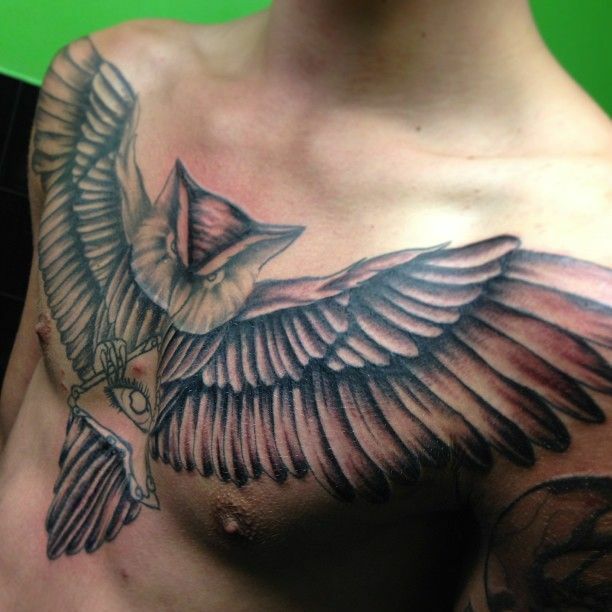 The wings of the owl grace the chest of its captive to hold him in constant flight. Ripping free fantasy. The life like revelation of an automated being breaking free of its human host elicits chills and defeat in its triumphant escape. 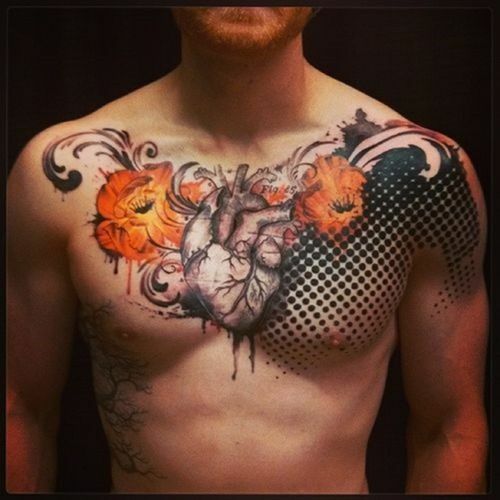 Trickling blood beneath this pectoral masterpiece appear real enough to smear on this suffering soul. Boundless Guardian. The wingspan of the guardian spread from shoulder to shoulder in this extraordinary depiction of the all-knowing eye protected and carried across all time. There is protection and solitude in the great owl that flies so willingly to allow vision to expand. Glorious Heart. The ability of the heart to feed and maintain the rest of the body is exemplified here in this artful summary of the heart’s mission and power. Centered and limitless the heart sends its oxygenated blood in all directions at all times. 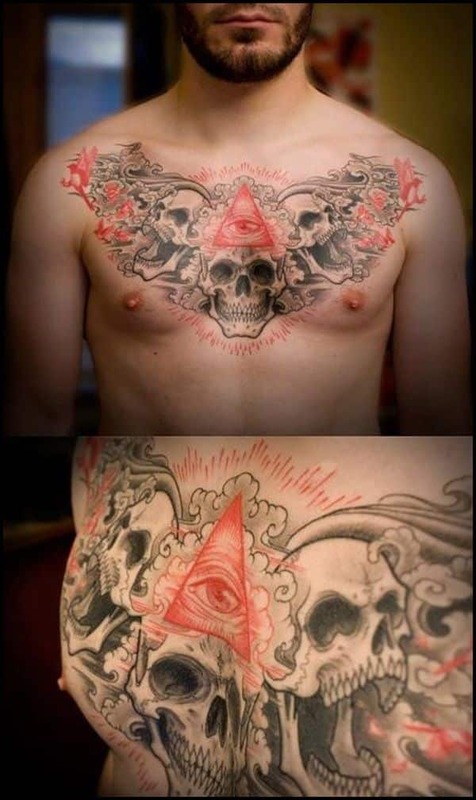 Triplicate of smiling skulls protecting the pyramid of the all-knowing eye. Delicately accented in red, we are reminded the eye that sees all is hereby guarded by opened mouthed and smiling skulls that vanquish the ideals of an unending vision and knowledge. Elaborate Complexity of Media and Form. The composition of so many textures brings the detail of each to be seen in this wild mix of untamed visual stimulus. 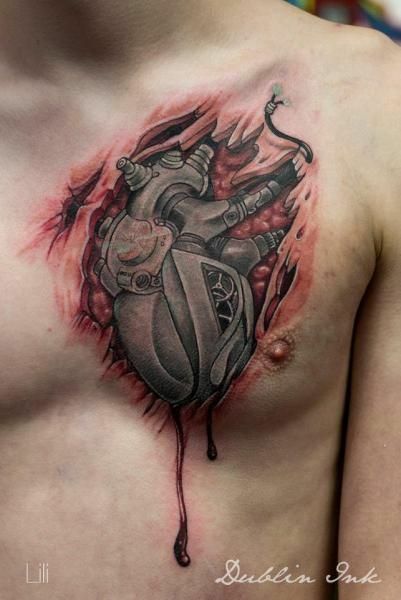 The eye cannot seem to deduce where to start and finish viewing such an intense work of art. Incredible color and excellence. 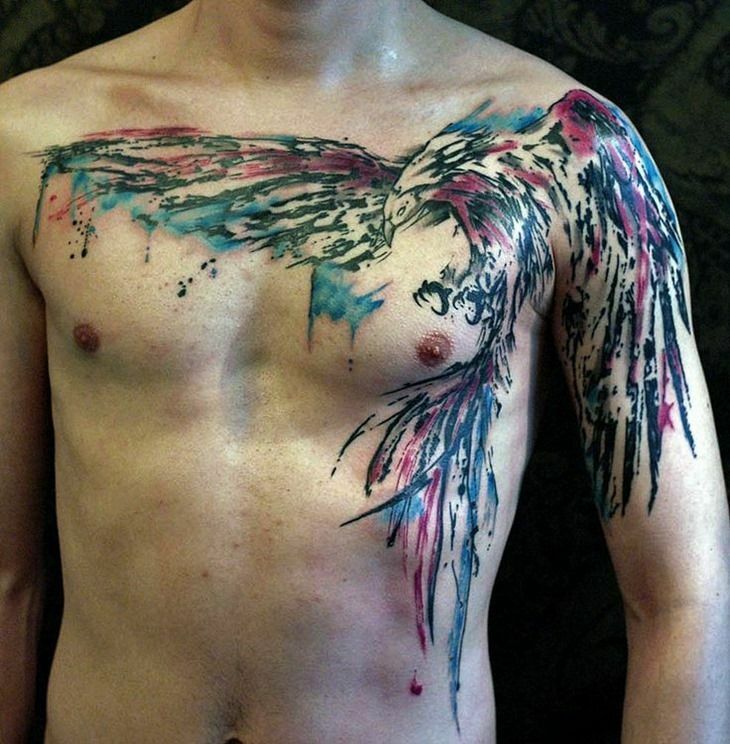 This shoulder to chest framework tattoo of color and craze is a spectacle to behold. The talons are at the ready and the wings and tail wrap around the form of the body to deliver a vision of color and beauty.